So it is to provide extra information with the text in order to further define it. These annotations can be used for presentation and processing of the text. It can also set some piece of text aside from such treatment. Generally, the presentational aspect of markup are considered and used. These languages describe how some data should be formatted and displayed. They are document formatting in nature. Since we have different data display requirements in various scenarios, there are many markup languages developed to handle them. HTML describes formatting of documents displayed in a browser. So it is browser specific and cannot be used outside its context. The idea of Markdown is considered an opposite of Markups. This was created by John Gruber in 2004. For Markdown, we describe how data should be presented, but this is not specific to any target engine. You can develop a parser to render the input text to your required format. As the world is getting older, we have more and more need to support cross platform applications as developers. 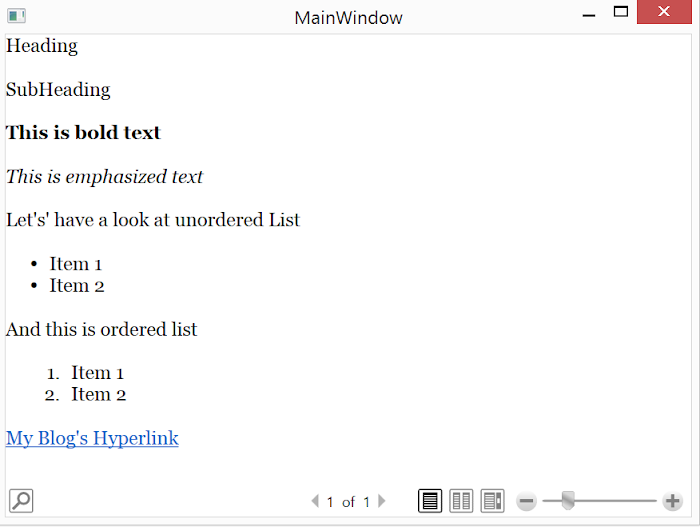 So, we can write some text in a Markdown style and transform it to the format of our choice. The concept is similar to Rich Text Format (RTF) but this is not properietry. There are a number of markdown flavors but we are not going to discuss them here as they still need to be standardized. The standard file extension of a markdown file is *.md. As Markdown has gained popularity, it has enjoyed very fast industry wide acceptance. The most popular amongst the adopters of the format is StackOverflow.com. Wordpress and other Blog Engines have plugins to support the format. Even GitHub's Read Me file uses this format. Vim , Notepad++ and Sublime editors also have plugins to support Markdown syntax highlighting and previewing. There are many markdown editors available. They are available online and for installation. I am listing some of them here. Just search for Markdown Editors. Let's write some Markdown now! Let's write some markup now. Here we are using Markdown.Xaml tool. The tool can be downloaded from here. You can download the markdown text from the following. It is in markdown format. Since we have saved it using *.md file extension, it is displayed as formatted. Just select View Raw from the following editor. Let's see how easy it is to convert the Text to Html. We can use MarkdownSharp nuget pacakge for this purpose for our .net applications. 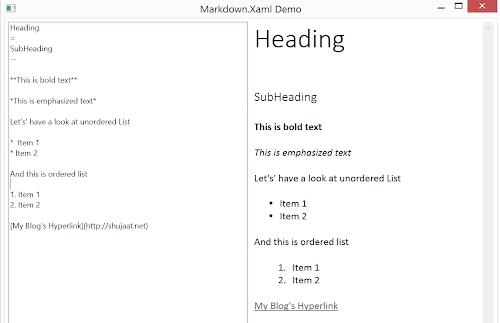 It provides the type to transform a markdown text. The tool supports transformation to HTML format. Let's see how the converted text looks like. 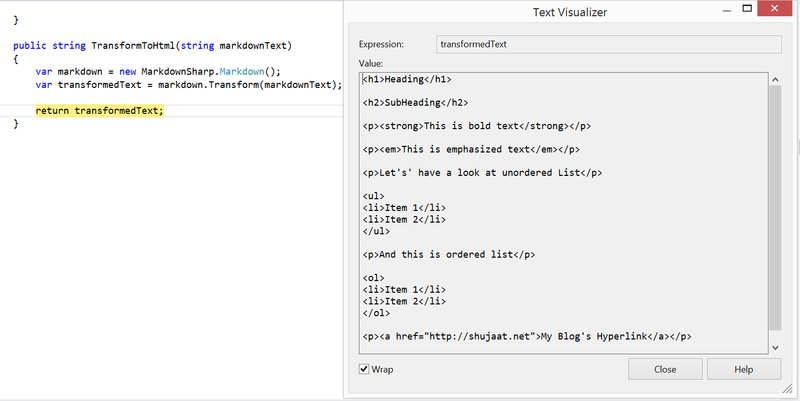 Here we are previewing the converted text in Text Visualizer in Visual Studio. How to use this for WPF? Since this is giving output as HTML, the easiest option is to use a browser control and somehow render this converted HTML as browser already supports such formatting. What if we don't or can't use it like that. Is there a way to show it as native WPF. Yes, there is. But we need to use a solution from Bevan Arps. There is currently no nuget package for this. But since the code is available on GitHub, we can get the code and build it locally. We can the use the library and reference it in our project. Running the code would read the markdown text from the file. It then transforms it using the Markdown type. The type transforms the text into FlowDocument, which can directly be used in a WPF application. As you can notice, the utility is not perfect as you can notice that Heading has not been transformed correctly. But this can be good enough for your needs. Just check it out! This solution should be good for WPF. Silverlight doesn't support FlowDocument yet. So you might want to search for other solutions for markdown. 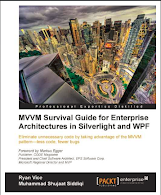 Although you should be able to find some Markdown editors in Windows Phone and Silverlight, but I couldn't find a Markdown viewer for them.